. 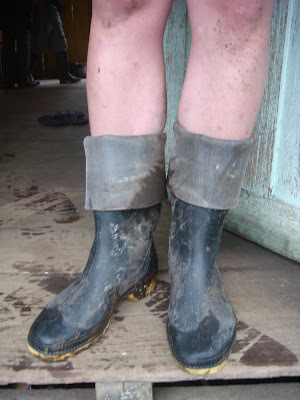 If Dame Viviane made wellies (does she? I want some), she would make them like mine, I am sure. The ingenuity brought about through practicality lends itself a particular style. 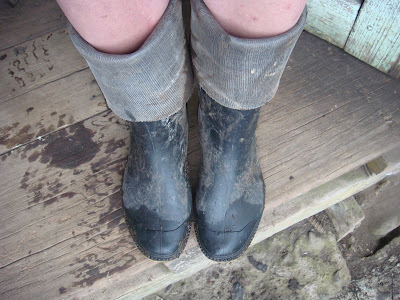 My socks are too short for my boots, and so walking and working in humidity for hours causes chafing and an unsightly rash if I don´t have trousers tucked inside. And so my ´pirate´turn downs provide a simple and chic solution. So far I have yet to find an answer to the question of the mid-calf tan line. .....and tonight, I will attempt to give myself a haircut with it.